The acrylic case isn’t the only one that Belkin released for the second generation of Zunes. Another case released by them recently is their leather sleeve case for the Zune 80 ($29.99 USD MSRP) and Zune 4/8. Did this case meet the quality I’ve come to expect from Belkin? Read on! The leather case is a very simple case. If all you’re looking for is something to protect your player, you don’t need to look any further as this case will do just that. The case is attractive, made with black leather and having cutouts for the controls on the front and openings on the top and bottom for your headphones and sync cable. Very importantly, the case has a clear plastic covering over the screen which is the part of your Zune that you’ll want to stay safe. 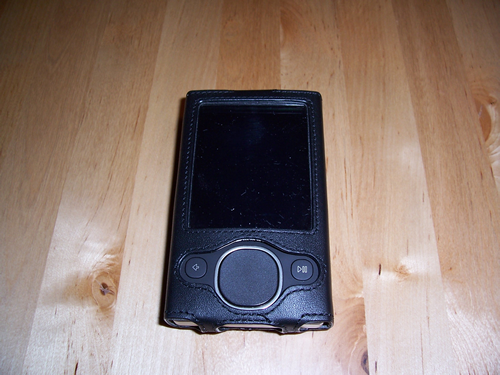 The Zune is held in by a Velcro strap that really isn’t necessary as it is very difficult to remove the Zune once it has been put in the case. On the back is a belt clip which is not removable. See, I told you that there wasn’t much to it! But that’s the idea with this case and if you’re looking for some simple and attractive protection for you Zune at a reasonable price, this Belkin case should fit the bill just fine. David Tucker is a software developer who writes for Zune Thoughts in his spare time. He is a fan of all things technology. If it runs on electricity, he wants it! He currently resides in the subtropical paradise of Florida.